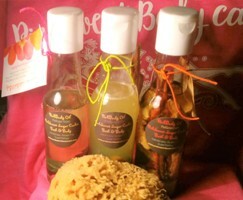 Our PinkSweet Body Oil is a complete bath and body product awesome for skin, hair and nails. Prepare for constant moisture with our exclusive PinkScents'. PinkSuga Kisses: A fave for anything PinkSweet, a hint of cherry infused with imported Madagascar vanilla beans. PinkLemon Lush: A clean fun scent with fresh lemon infused with dried apples, and fresh cotton petals for an extra bath treat. PinkSpiced Latte:A hint of caribbean chocolate, infused with dried apples and fresh nutmeg. PinkJasmine: A floral but romantic PinkScent infused with cotton petals. PinkCandi Rain: Notes of berry, and fresh orchid infused with lavender buds and love. 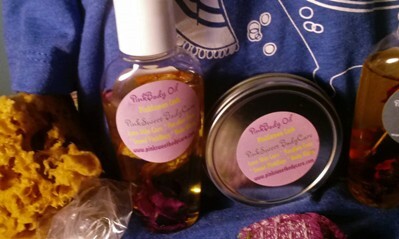 All of our handcrafted body oils are truly body desserts', melting directly into your skin hydrating to PinkBody Therapy perfection. Our PinkRadiance is your natural glow. This is an all over hair, nails, feet and bath product.